Walking in Sunshine Blue Ridge Autism and Achievement Center’s Lexington branch recently held a grand opening celebration for a nature trail built by Washington and Lee University engineering students through a community partnership. 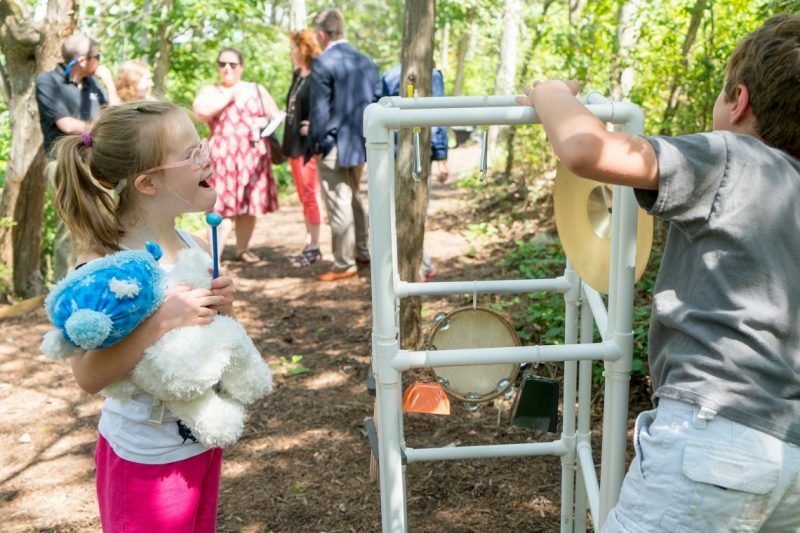 Children play at a sensory station along a walking trail built by W&L students at Blue Ridge Autism and Achievement Center’s Lexington branch. Sept. 7 was a stifling day in central Virginia, but students at Blue Ridge Autism and Achievement Center’s Lexington branch were perfectly content to shun the air conditioning and explore the facility’s new outdoor nature trail. 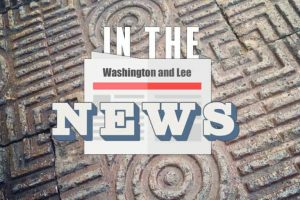 The trail, which was designed last year by four Washington and Lee University engineering students, was officially dedicated at a cookout and celebration that Friday afternoon, during which BRAAC also presented W&L with a plaque of appreciation. Meagan Harding, a behavior analyst and special education teacher at BRAAC, said their students flat-out love the new trail, which includes interactive stations and doubles the facility’s activity space. Prior to construction of the trail, students there had no playground, only an overgrown, wooded area behind the building. “From the moment we first showed them the trail, they were begging to come outside,” Harding said. With locations in Roanoke, Lynchburg and Lexington, BRAAC serves families who face unique learning challenges, including autism, ADD, and physical or visual impairment. The Lexington office works with children ages 2-16. Annie Jeckovich, Walker Brand, Kyle Ruedisili and Ryan Brink, all members of the W&L Class of 2018, spent their senior year designing and mapping the trail, raising money and securing volunteer labor, and finally overseeing its completion. 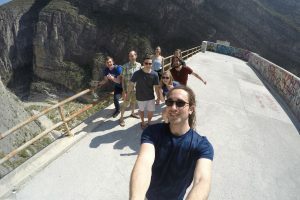 They were advised by Professor Joel Kuehner and Associate Professor Jon Erickson of Washington and Lee’s Department of Physics and Engineering. The students were able to liaise with BRAAC through W&L’s Office of Community-Based Learning and create a community-based research (CBR) project. Such projects provide students, faculty and community partners an opportunity to collaborate on mutually beneficial research aimed at addressing community-identified needs. The walking trail also fulfilled a new year-long capstone project requirement for engineering majors. Sensory stations have been added along the finished trail to give kids a chance to play and experience interesting sights and sounds. A music station includes drums, chimes, a small xylophone and other noisemakers; further down the trail is a crazy mirror with nine convex circles, as well as a small playhouse. At a brief dedication ceremony before a ribbon-cutting, BRAAC Development Director James Garner thanked everyone who contributed to making the trail a reality, including Jim and Brenda Fonner, owners of Park N Pool Corp. in Lexington, which donated the land for the trail. Jim Fonner passed away in January 2017, but his wife was present to see the trail dedication and a bench along the trail that will bear an engraved plaque in his memory. Angie Leonard, CEO of St. Vincent’s Home, the umbrella organization for BRAAC, said that working with W&L on the project was a very positive experience.